See below for the list of forthcoming demonstration opportunities. Nestlé has entered the UK market following its takeover of Pfizer Nutrition/Wyeth and the SMA formula brand. We are know seeing the aggressive marketing practices it uses in the rest of the world being used in the UK. For example, it is running a series of events targeting health workers to build contact lists and to draw them into defending the company and promoting its interests and products. Nestlé is attempting to circumvent the restrictions many health facilities have in place to stop company representatives targeting staff. In these health facilities, companies can only provide information on their products to a designated expert staff member (or a multidisciplinary committee in some regions), who will assess the accuracy and only pass on what is necessary. In some cases, the events are on issues such as vitamin D, iron, colic and allergies. Nestlé uses misleading claims on these issues to push its products. In other cases guest speakers will speak on other child care topics to entice health workers to the event. Health workers can obtain independent information on how best to provide nutrients and deal with health problems, together with analysis of company claims, from First Steps Nutrition Trust. Show your independence from Nestlé using our Nestlé-Free Zone – say NO for formula company sponsorship stickers. This is simply not true. See our post Health workers, conflicts of interest and the baby feeding industry for the actual requirements of the International Code and Resolutions and UNICEF Baby Friendly. Working with the NHS at a territory level, you’ll be developing long-term, mutually beneficial relationships with key stakeholders and opinion leaders to support brand endorsement and strategically aligned education for Healthcare Professionals. Baby Milk Action is organising protests to encourage anyone turning up to consider the conflicts of interest in attending a company event. These events are also a great opportunity to raise awareness of wider concerns about Nestlé practices and Baby Milk Action has produced a kit of materials for anyone interested in demonstrating. We are looking for just a handful of people to hold placards and provide leaflets to anyone willing to take them. Anyone working for a health facility can also alert the management so they can remind staff of their policies on meeting with company reps. The UNICEF Baby Friendly guidelines are useful on this point – click here. Click here for information on some recent protests. Forthcoming events are listed below. We are looking to to hand leaflets to anyone arriving at the start of the events (leaflets, placards and guidelines will be provided). During the registration period, Nestlé generally provides a buffet and promotes SMA products on a stand, as well as during the event. Location: Durham, Hallgarth Manor Hotel, DH6 1AB. Time: Leafleting from 17:45 for 18:00 event start. 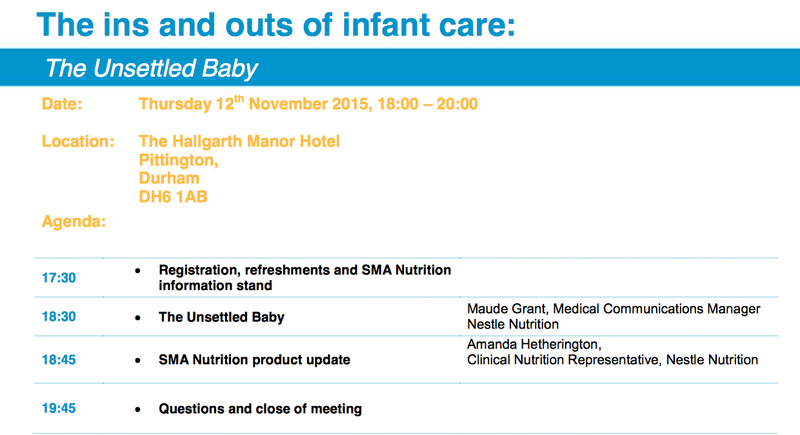 This event is ostensibly about the “Unsettled Baby”, but the programme shows there is an hour of product promotion at the start and at the end. The session on the headline subject is just 15 minutes long – and the speaker is from Nestlé in any case! This is the same programme as the Durham event above. Time: Leafleting from 17:15 for 17:30 event start. Contact Baby Milk Action for leaflets to distribute warning of misleading information and the cases won at the Advertising Standards Authority. We will provide you with a demonstration kit and guidance. Join our email alert list to receive updates on events. You can also join the Baby Milk Action Facebook group. Click here.